Looking for that perfect loaf of homemade gluten-free bread? 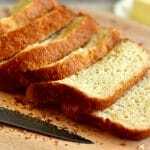 Try my easy gluten-free bread machine recipe that will satisfy cravings for soft and tasty bread. Includes dairy-free option. The first step in making bread in your bread machine is to add all the wet ingredients first to the bread baking pan. Warm the milk and melt butter. I combine this step and add the milk and butter to a large glass measuring cup and heat in the microwave. Pour warm milk and melted butter in the bread baking pan. Pour the honey into the bread baking pan. Pour the beaten eggs into the bread baking pan. Add the apple cider vinegar to the bread baking pan. Now it's time to add your dry ingredients. Add the flour, salt, and xanthan gum (leave out if your flour already has it) to the bread baking pan. The last step is to add your yeast. First, make a little hole with your finger in the flour. Pour the yeast into the hole. Start the bread machine and set to the gluten-free setting. As your bread machine is mixing, you will need to go in and scrape the sides down into the batter with a spatula. Your bread machine may be different and you may not need this step. Not all gluten-free flours are created equal. You may experience different baking results depending on the gluten-free flour blend you choose. I like Pillsbury gluten-free. I usually store the leftover bread in an airtight container, once it's completely cooled. It may be kept on the counter (at room temperature). It is also best not to slice the bread before you store it, so just store the left-over portion of the loaf. I like to reheat my bread the next day because the gluten-free bread is best when warm. I have an Oster bread machine that has a gluten-free setting.